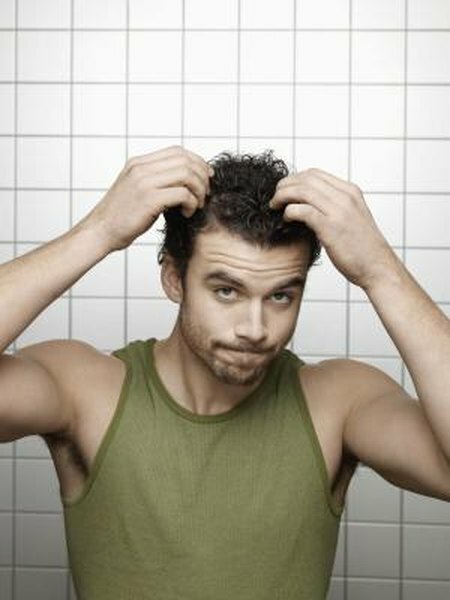 A dry, itchy scalp is a common problem that can stem from a number of sources. According to the Ronald Marks, author of "Practical Problems in Dermatology," the most common cause of itchy scalp is simple dry skin, and poor dietary habits are a risk factor that can make you more susceptible to dry skin, itchy scalp and dandruff. A well-balanced diet rich in nutrients that promote healthy skin can help relieve scalp itch and dryness. Dry skin issues such as an itchy scalp can be an indication that you are not getting enough essential fatty acids in your diet. According to the Linus Pauling Micronutrient Information Center, dry skin is among the many symptoms of essential fatty acid deficiency, and omega-3s are the fatty acids most likely to be deficient. Foods rich in omega-3 essential fatty acids include cold-water fish like salmon, mackerel, tuna and sardines, as well as walnuts, flax seed, pumpkin seeds and canola oil. Vitamin A is essential to skin and scalp health, according to the Linus Pauling Institute Micronutrient Center; Vitamin A plays important roles in the immune system and blood circulation as well as supporting the maintenance and function of skin cells. Adding foods rich in vitamin A to your diet might help improve skin health, alleviating scalp itch. Foods that are good sources of vitamin A include eggs, butter, dairy products, sweet potatoes, squash, carrots, cantaloupe and papaya. B vitamins perform a variety of functions in the body that contribute to skin health. According to the National Institutes of Health, Office of Dietary Supplements, B vitamins support the circulatory system to ensure that oxygen and nutrients go throughout the body, aid in metabolism, and assist in the creation and growth of new cells. Foods that are good sources of B vitamins include meat, poultry, dairy products, whole grains, potatoes, beans and leafy green vegetables. While vitamin C is best known for its role in the immune system, this nutrient is also important to skin health. According to the Linus Pauling Institute Micronutrient Information Center, Vitamin C gives vital support to the circulatory system by aiding in the production of collagen, which is crucial to the structure of blood vessels. Vitamin C-rich foods include citrus fruits and juices, kiwi, strawberries, green peppers, Brussels sprouts and spinach. According to the National Institutes of Health, Office of Dietary Supplements, zinc is essential to healthy cell growth and development, which is necessary for the maintenance of skin, hair and nails. Deficiency in this mineral can contribute to the development of a variety of skin conditions such as itchy skin and scalp, dandruff and eczema. Foods that are good sources of zinc include meat, poultry, seafood, whole grains and nuts.